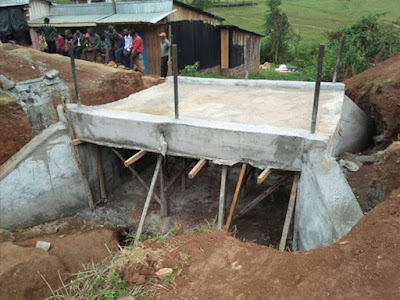 Wednesday, August 29, 2018 - Residents in Bomet County staged protests over the construction of a shoddy bridge that cost the County Ksh 8.4 million. They stormed the site where the construction of the controversial bridge was going on and chased the workers and contractor away, accusing them of working in cahoots with County officials to embezzle funds allocated to the construction of the bridge. There is no way such a bridge can cost Ksh 8.4 Million. The contractors did a shoddy job and embezzled the money allocated to the construction of the bridge. See photo of the Ksh 8.4 Million.